For those not familiar, the AR-18S was the sub-machine gun version of the select fire AR-18. This was the inspiration for my shorty project. These two pictures started it all. Pete Fleis did a handful of these conversions and there are some factory made guns. 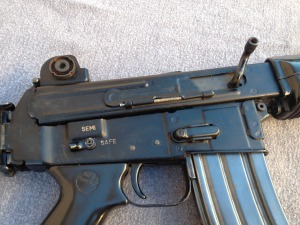 There are even a very few semi auto AR-180S guns floating around. While mine will be a pistol to start, I fully intend to sbr it and have it turn out a close match for these two guns. I have subsequently found a few more pictures of the cool little guns but have yet to come across any documentation about production numbers. 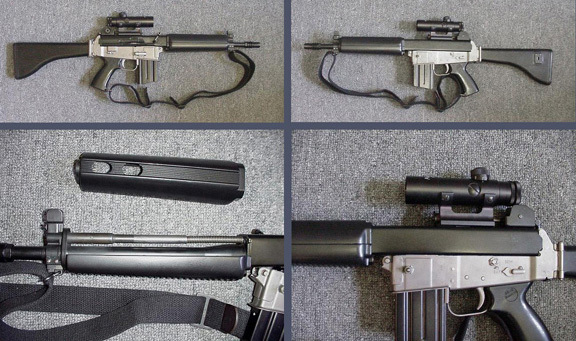 I believe this to be a factory Sterling AR-18S. 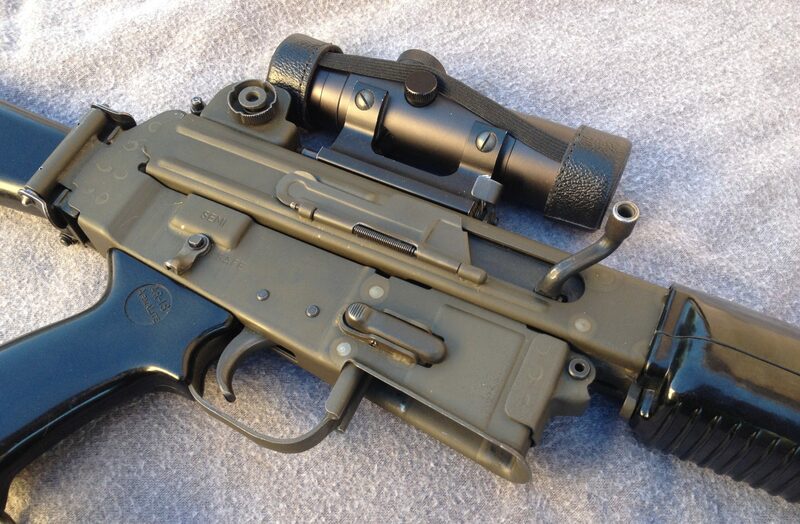 I believe this is a factory AR-180S but the jury is still out. 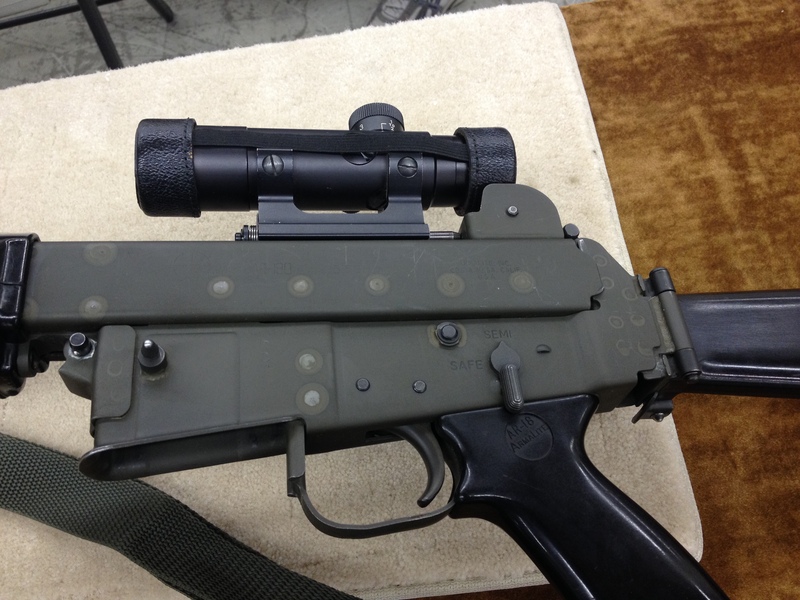 You will note that there are three types of flash hiders used on these guns. Small conical, Large conical, and standard three prong. 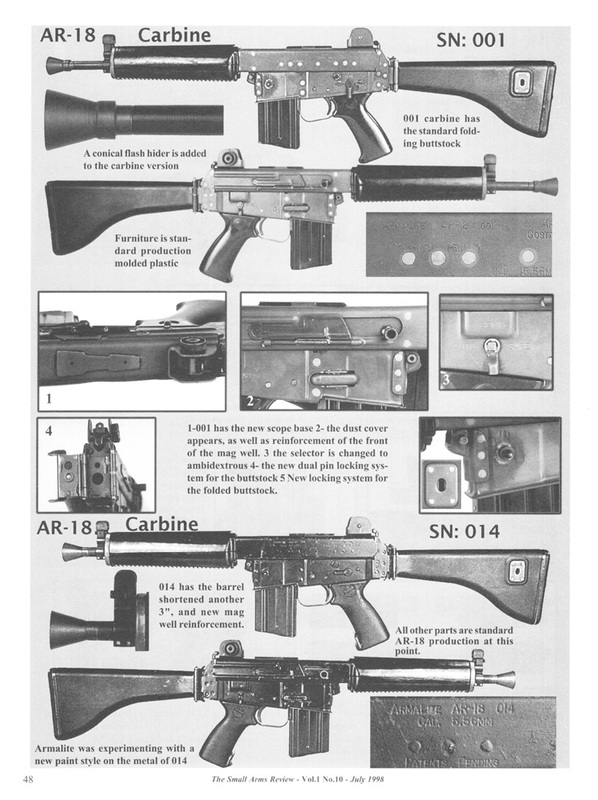 I will leave you with this scan from Small Arms Review that shows the very first carbine prototype. I wonder where this one is now. This project could not be possible without the new NoDak Spud NDS-18S lower receiver and the fine gun-smithing skills of John Thomas at Retro Arms Works. Links at the end of the article. 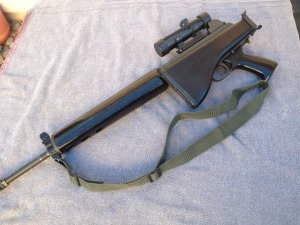 The first thing that crossed my mind when the NDS-18S lower receiver was released was the possibility of building a pistol. I immediately ordered one of their lowers and started looking for an AR-180B. 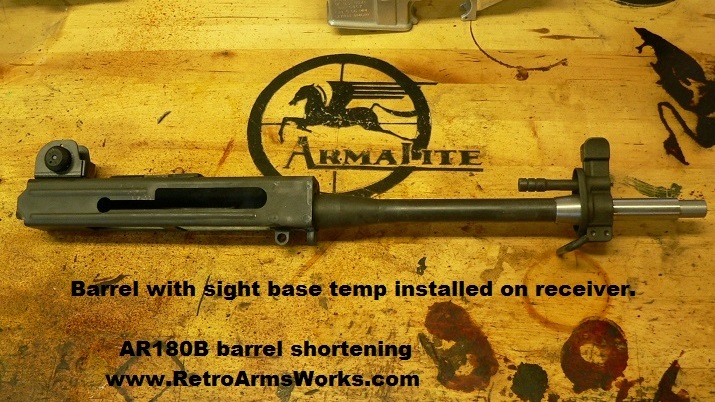 For those who are unfamiliar, the AR-180B was a new version built by the new Armalite Inc. starting around 2001. Again it didn’t meet sales expectations and was dropped. Dropped too soon in my opinion. 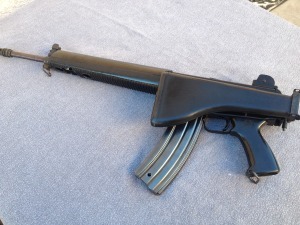 I found a likely candidate on gunbroker and like one of my earlier Sterling guns, it was like new, unfired. My daughter and I quickly remedied that problem. After I made sure it functioned properly I pulled the lower apart and build my new NoDak lower. 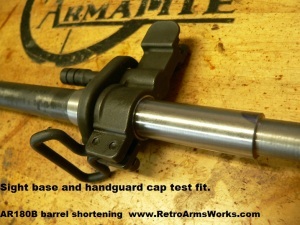 I then sent the upper off to John at Retro Arms Works. 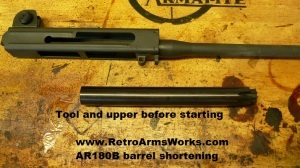 He jumped right in and after a little hick-up removing the barrel, he sent me pics of the progress so far. 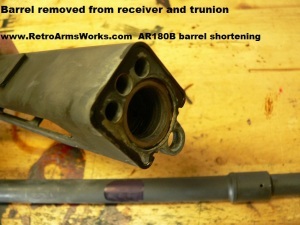 Unfortunately the front sight base on the AR-180B is larger than the barrel so it had to be sleeved. It still needs the barrel parkerized, barrel installed,gas port drilled, and the operating rod made and fitted. Anyone who searches out their own, will most likely encounter the Sterling AR-180. 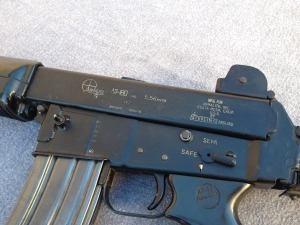 With three times the production of either the Costa Mesa or Howa guns, this makes perfect sense. However, there are three distinct finishes that were produced. Parkerized, Blued, and Painted. The subject of todays post is the painted variety. This finish is also known as Stoving. It is unfortunate that many of the Sterling guns with this finish will show many scratches and handling marks as the stove finish does not hold up well to abuse. To the collector condition is everything. Finding a clean example of a painted Sterling can take some doing, or in my case, a little luck. I purchased this example from gunbroker mainly for the accessories that came with it. The pictures were horrible and I was sure it was going to look like all the other low grade examples. I was looking for a truck gun and was pleasantly surprised to find it was in very good shape. 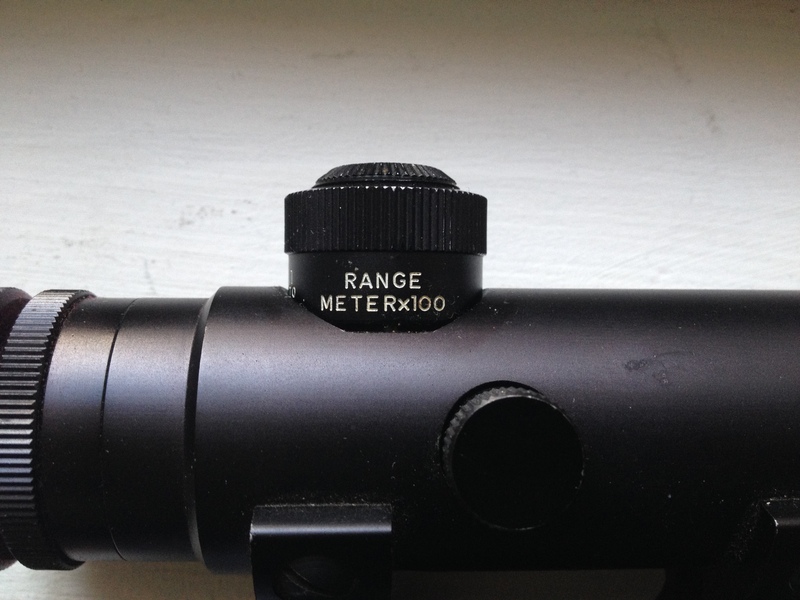 It has some markings from a scope being mounted but is in otherwise fine shape. It has been fired and will make a great range gun. The search for a truck gun continues. This gun did however, come with a broken lower hand guard. I was fortunate that one was available, although the price would probably scare you. While AR-180 collecting is not for the faint of heart, it is surly less expensive than Colt Python collecting. I did that for awhile but I just can’t justify paying the prices anymore. I also think that they are vastly overpriced considering that over 150,000 were produced over 50 years. Contrast that with just over 20,000 AR-180’s produced in the span of 16 years. Several thousand of which were never brought into the country or were exported after the fact. Costa Mesa AR-180, How it all began for me. My journey began in late March 2014 at a local gun show when I found this lonely Costa Mesa AR-180 on a table in the corner. It really spoke to me but I didn’t know anything about them. 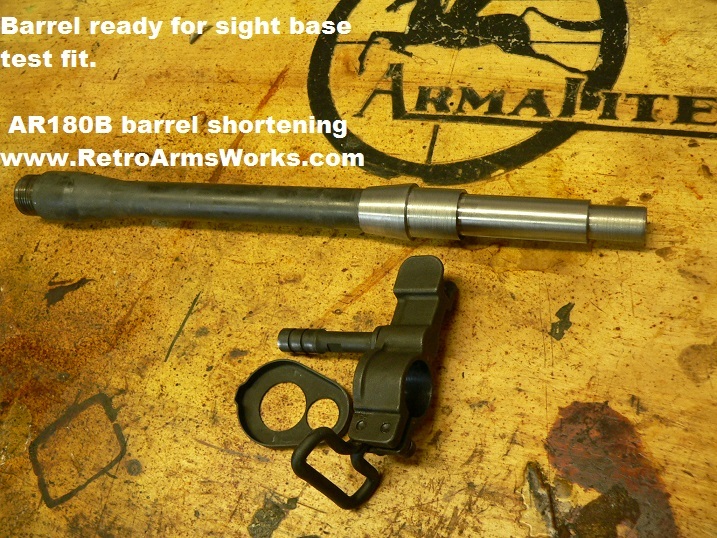 I posted some questions in the retro forum over at AR15.com and found a lot of very knowledgeable folks over there. I decided I wanted to buy this gun but did not have the owners contact info, but I had left mine. Luckily he gave me a call. It took me a week to work out a parts plus cash trade with the owner and I was able to bring her home. Not only did I get the gun but lots of mags, an inverted post scope marked in meters, and all the original paperwork. It is an early three digit gun made in Costa Mesa California. No production dates for individual guns are known but I suspect it was made in late 1969 or early 1970. It is in excellent shape. 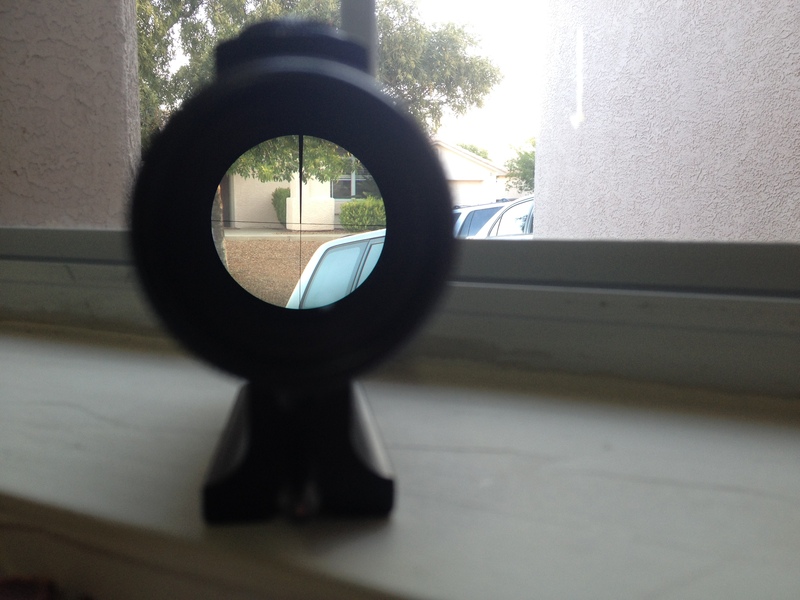 It has a few marks where the scope was mounted and where the bi-pod was attached. Other than that, it is like new. 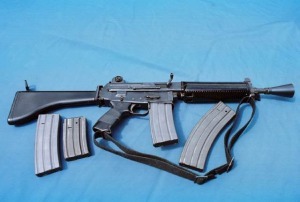 It is also the gun pictured on the first page of my blog. 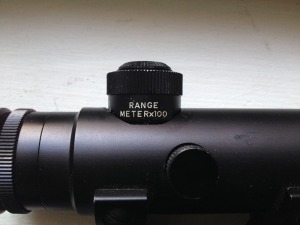 The earliest scopes were marked in meters and featured an inverted post. 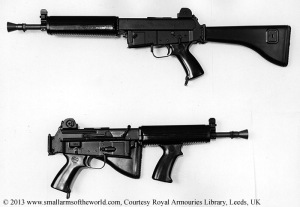 Three manufacturers built AR-180 rifles. Costa Mesa, Howa, and Sterling. 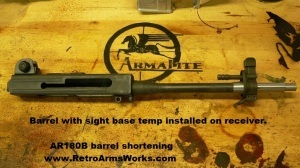 4018 Costa Mesa AR-180 rifles were produced from 1969-1973. 3927 Howa AR-180 rifles were produced from 1970-1974. 12,362 Sterling AR-180 rifles were produced from 1979-1985. Learning more about what I had, just fueled my hunger to find out more. I then began the process of finding and consuming all the info I could lay my hands on. I hope to bring what I have learned, and continue to learn, to you. I also invite you to contribute and help guide the direction of this site. Let’s make this the central depository for AR-180 information.